Martin van Meytens ōe ê siōng. 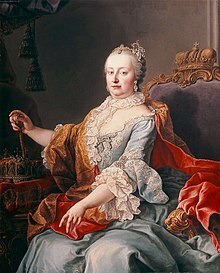 Maria Theresa (1717 nî 5 goe̍h 13 – 1780 nî 11 goe̍h 29) sī Ò-tē-lī ê tāi-kong kap Hiong-gâ-lī kiam Bohemia ê lú-ông. I sī Habsburg Ông-ka ê kun-chú, tong chiap ūi ê sî, ín-khí liáu Ò-tē-lī Kè-sêng Chiàn-cheng. Kathleen Kuiper, pian. (2010). "Maria Theresa". Britannica Guide to the World's Most Influential People: 100 Most Influential Women of All Time. Encyclopaedia Britannica, Inc. ISBN 978-1-61530-058-7. Chit ia̍h siāng bóe tī 2017-nî 10-goe̍h 13-ji̍t (Pài-gō͘), 06:08 ū pian-chi̍p--koè.